"Why don’t all cars have no doors? When I come to power I’m going to make it a rule, because this is just better!" - Jeremy Clarkson. Sell my Moke? I'd rather sit on a cactus! It's a bit more porky than I would have liked. With 12v battery and spare wheel, but no mattress or any luggage inside it weighs 250kg already. So with mattress, food, water, clothes etc it will somewhere around the 300kg mark I reckon. I was hoping to keep it around 200kg unladen. When I get around to uploading the pics somewhere I will do a build thread. It's a box section chassis, aluminium frame, aluminium composite panels with insulation and a thin ply lining inside. The Moke pulls it fine around here as is (1310cc with plenty of torque), and I live in billy goat country now. So it should be okay. I was towing it to Newcastle behind my Land Rover just before Christmas. I hit something on the Hume near Gundagai. The RH trailing arm bent severely and the cross-member tore off the chassis taking both suspension units and the wheels with it. The trailer went a good two or three feet in the air. Damage to the body and chassis is minimal fortunately, as it came down on the underslung spare wheel and the rubber bumper on the rear edge. No damage to anyone else or any cars fortunately. It's now resting at a mate's place near Wagga until I can get up there to repair it and bring it home. I've bought different suspension units fot it this time. The ones I used before were "Peak" brand and very cheap. I'm upgrading to "Maypole" brand which are double the price but have a better reputation. On a recent trip with SharaDust which was likely to be the last tenting adventure I decided to record a few facts. M-ute fully loaded with the camping gear, along with Faye and I in the car we weighed in at 1190kg at a weigh bridge near Hobart. Back home and all the camping gear and human bodies removed recorded 820kg at a local weigh bridge. Trailer construction will be focused on weight, I think Faye and I need to also focus on a weight reduction process. The problem is that Mokes are physically capable of carrying a lot more than legally allowed, so its really easy to stuff them full of gear and exceed the 998kg GVW. M-ute's tray would already be soaking up a good bit of the payload. Spotted a neat looking latish silver Californian towing what looked like a very compact pop-top camper this morning. Heading toward Hobart on the Southern Outlet. It would be interesting to know what the trailer was. The Moke was getting along pretty well. Hi Tim, that would have been Sharadust, Sharon and Grant spent a week with us on the East Coast and Hobart recently and then stayed south for the wooden boat festival. 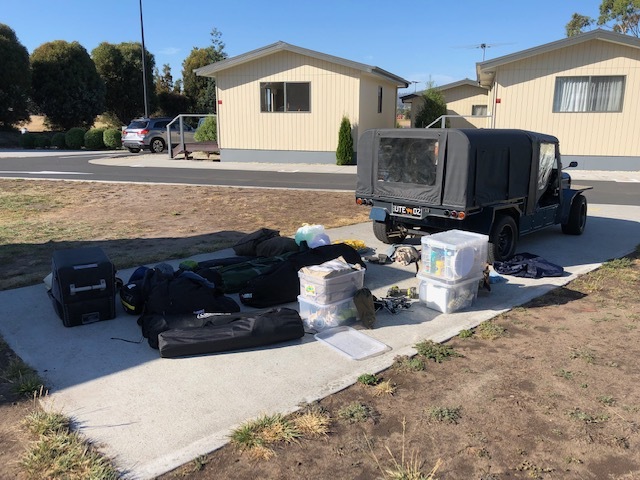 Yes a very tidy combination (Moke and camper trailer) however will leave details for Grant to advise other than to say that S&G are a little smaller than Faye and I and therefore trailer not suitable for us. Moke engine has recently been overhauled and pushed me all the way down the coast road. Hello Tim yes probably was us We stayed at Heron Rise Vineyard Kettering Thursday night Excellent spot very quiet clean as and people easy to get on with Recommended. Wooden Boat Festival was good Kind of like people looking and asking questions about boats instead of about Mokes eh. I wouldn't be worried about BB, I always drop in for a play on the scales at Broadford whenever I am going past in the Moke and never had an issue and I am usually 100kg plus over each time. Will be checking how much weight I have put on this Thursday on the way past. Same with the free scales out past Ballan, used them a couple of times too. I use the Ballan scales a lot too. When I was building the trailer I decided to tow the bare chassis up there. Just wheels and a chassis, no guards, no lights. I got pulled for RBT. Local Constable says "What's this then?" I told him I was just taking it up the weighbridge. Response: "You've got too much time on your hands if you built that yourself. Just take it straight home after. Now get out of here before Sarge sees it." Sounds like a good setup Grant, you were looking good on the road. Are you travelling with others? I spotted a Vic rego orange moke with an orange Bali soft top in town today. The place is crawling with them! That sounds like Geoff is in town. It is a 1275 with Auto. I might be down there is a few weeks too, not in a Moke though, to pick up some goodies. The rear window was a peace symbol. Are you coming back for more of our goodies Terry? Geoff is a lost flower power child throwback. Not really your goodies, just helping someone bring back to Victoria some non Moke gooides that went to Bruny Island a few years ago. Not exactly sure what I am helping pick up, waiting to see the photos.